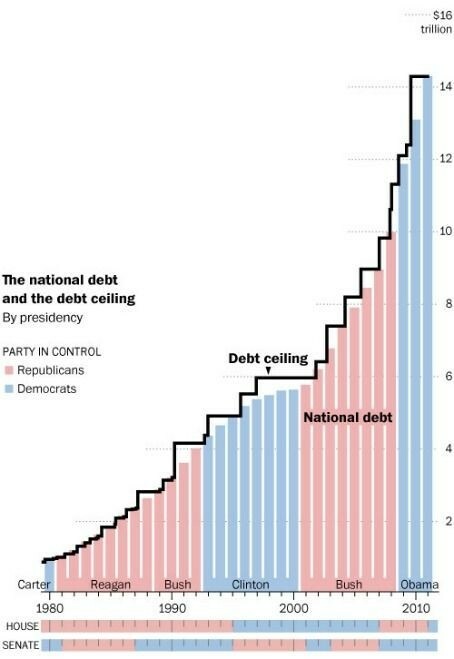 The following picture presents 30 years of the debt ceiling and every time it has been raised. It is an artificial media-based side show, and it will be raised before August 2nd. The only power to stop our government from spending is not a fictional debt ceiling, but the collapse of our bond market and currency. That is coming. Excellent analysis from one of my favorite economists, David Rosenberg, who explains to CNBC why growth has been slow during this current recovery. We are not in a typical manufacturing based recovery as we have seen over the previous few decades. We are recovering from what he terms a "balance sheet" recession, meaning too much debt was taken on by business, consumer, and government balance sheets. I call it a depression. We get some humor at the end when Steve Liesman tells Rosenberg we will not get another recession because "the economy does not need it right now." This is why Liesman is considered the media's spokesman for the White House. One of my favorite television shows is LOST so we're going to play a game called housing bubble flashback. For LOST fans, click the play button below for sound effects during the ride. The following picture is from a New York Times article written February 3, 2005 titled "Condo Fever Turns Buyers Into Early Birds." NGELINA UMANSKY, a 39-year-old spa owner from San Francisco, was visiting a friend in Miami two weeks ago when she heard about a new condo development downtown. Hoping to find a vacation home, but worried that others were interested, too, Ms. Umansky arrived at the sales office at 8 a.m. the day after seeing some model units. About 50 other buyers were already in line. Two hours later, a sales agent summoned her and said she had four minutes to decide which unit to buy. She acted fast, offering $350,000 for a two-bedroom, two-bathroom unit. Ms. Umansky thinks she got a bargain; when she called on behalf of a friend less than eight hours later, she was told the asking price on a unit like hers had climbed to $380,000, a nearly 9 percent price increase. Buyers review floor plans and maps first at a Web site or in a brochure. When they arrive at the sales "event," typically at a hotel or a convention center, they spend five minutes looking at a map and choosing a home before the next buyer moves to the front of the line. Price increases - up to 16 a day- are announced over loudspeakers. "People get excited and get caught up in it," said Joel Lazar, a Transeastern vice president. "Even if they weren't planning on buying a home, they convince themselves to buy a home." Last Sunday, Jeanette Gomez, a banquet server at a resort hotel, drove her mother, Maria Gomez, to her 11:12 a.m. appointment at a hotel in west Orlando. Although the senior Ms. Gomez wasn't planning to buy, she ended up making an $18,500 down payment on a two-bedroom town house. "I pushed her," her daughter said. "I said 'Just do it.' I think it's a good buy because the sales agent told us the price already went up $20,000 since yesterday." The following picture is from the Dallas Morning News written yesterday titled "Thousands Line Up In Red Bird To Apply For Dallas County Rent Assistant Vouchers." Several Dallas County sheriff's deputies kept things orderly, and Dallas-Fire Rescue paramedics were on hand in case of heat-related problems. County officials were to begin accepting applications at 8 a.m. but started early for the many residents who got there before dawn. About 6 a.m., officials told applicants who had already formed their own line to line up elsewhere, and there was a rush to the new spot. Daisy Emerson, 20, was among the first to apply after arriving at 4 a.m. to find what she estimated to be 3,000 people already in line. "It didn’t matter who got here first," she said. "People who came yesterday shouldn’t have even wasted their time." Earlier this year I read the book "Endgame; The End Of The Debt Super Cycle And How It Changes Everything." It is by far the best finance/economics book released this year. It takes a very brief moment to discuss how we got here, then looks at where we are going and why. The introduction to the book talks about why a crisis occurs. What triggers it? This is a fascinating question to me. 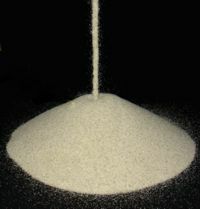 They compare it to a large pile of sand that was built spec by spec over many years. At a certain point, one additional piece of sand will fall on the pile and create a mini avalanche that changes the whole structure. But how do you know which piece of sand will create the fall? Was it the one additional spec that fell, or all the pieces that built up over the years? This is exactly how a debt crisis occurs. At some point the market loses faith in a bond market, and then it is just over. You can see it coming for years in advance, but to predict the moment it will occur is impossible. For example, analysts began arguing that the real estate market was in bubble territory as early as 2002, and banks were already beginning to loosen lending standards and create loans that had very little chance of performing without consistently rising prices. But it wasn't until 2007, 5 long years later, that the mortgage market began to implode. Two small subprime hedge funds owned by Bear Stearns announced that they were closing their doors due to defaults. This was the piece of sand. As an investor you can easily study the financial statement of Italy and determine that their bond prices staying stable in value depends on their ability to borrow additional money in the future to pay off current debt. 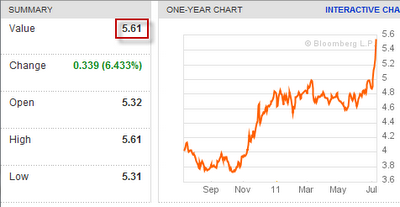 In the past week the interest rate on their bonds rocketed from under 5% to just under 6%. 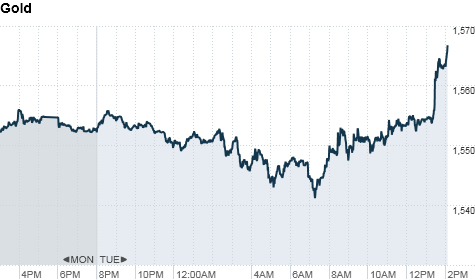 The value of the bonds went into free fall almost overnight. A spec of sand fell on the pile this week and created the small avalanche. But what was the trigger? Investors could have decided just as easily that they were going to sell Spanish debt. I have been discussing for months that after Greece, Portugal, and Ireland, the next catalyst would be either Spain or Italy, but there was no way to know which country the bond market would turn on first. This same exact scenario will occur with Japan, the United Kingdom, and the United States this decade. Today interest rates on United States debt are at all time historical lows. Rates for Greece were almost identical to the United States 2 years ago. It was obvious that subprime homeowners that made $25,000 per year and bought an $850,000 home back in 2006 could not make that payment. The loan would default unless they could flip the home for a higher price. At the time the loan was rated AAA and investors purchased the loan for close to the same interest rate as a government bond. Then the piece of sand fell in February 2007 with the Bear Stears hedge funds. Just like the piece of sand fell for Greece in March of 2010, and fell for Italy on Monday this week. 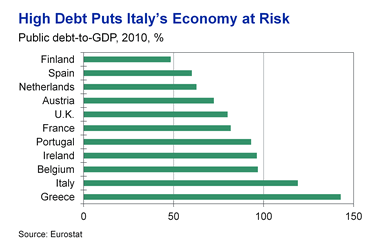 The following graph shows Italy's debt to GDP ratio meaning how much debt they owe compared to how large their economy is. It is very close behind Greece. An investor could have looked at this information last week, yet prices for their bonds traded at close to risk free valuations. This week prices collapsed. We are entering a time where the paradigm we have lived and invested in is going to completely change. You need to understand not what it means when your country enters a recession, but what it means when your country goes bankrupt. One morning you will wake up and the piece of sand will fall that triggers a run on the United States bond market. It could be tomorrow. It could be 6 years. But it is coming. "The Fed is not prepared to take action at this point." All markets sold off after the statement; including gold and silver. While I usually do not follow the day to day market moves here on this site, Bernanke's decision on when to begin the next round of quantitative easing is massive news, and it must be tracked closely in order to make investment decisions. New all time record high for gold this afternoon as the precious metal continues soaring. Silver is the leader on the day, blasting up close to 7%. 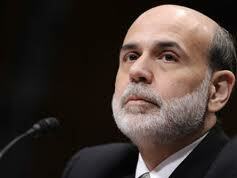 The catalyst is once again Ben Bernanke, who is currently taking questions before Congress on monetary policy. Bernanke continues to hint that if the economy continues to slow down, one of the tools in his closet is QE3. It is only a question now of whether Europe's continued catastrophic sovereign debt collapse can over power Bernanke's printing press in the short term. In the long term, all central banks around the world will inject paper money simultaneously to purchase the toxic debt and try to keep the current ponzi scheme going. Gold will continue to keep its accounting of the paper money created, as it has for the previous 6,000 years. In the mean time, we can continue to enjoy questions from Ron Paul, such as this one directed toward Ben Bernanke about gold. "Some participants noted that if economic growth remained too slow to make satisfactory progress toward reducing the unemployment rate and if inflation returned to relatively low levels after the effects of recent transitory shocks dissipated, it would be appropriate to provide additional monetary policy accommodation....A few members noted that, depending on how economic conditions evolve, the Committee might have to consider providing additional monetary policy stimulus, especially if economic growth remained too slow to meaningfully reduce the unemployment rate in the medium run." "Additional monetary policy accommodation" would mean QE3, which means printing to purchase assets. Now we just wait for Bernanke's announcement that QE3 is official before gold makes the next launch toward the $2K line. We can only hope that oil and food prices do not rise as well (they will) as already struggling Americans try to find a way to pay for the surging cost of living. 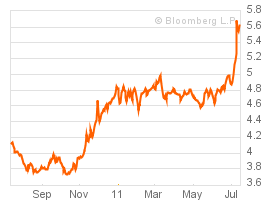 The Italian 10 year bond. The line going vertical means prices are in free fall.